... missed the first weekend due to a case of clueless. But I'll be hitting the next two. I walked around the city all afternoon, stopping by five or six open studios... two of them housed multiple artists, so I probably viewed more than twenty artists' work. Marcia Teusink: I loved her Submerged pieces, especially the Wreck at Pomonte series. All blue and really gave the feeling of being underwater. I loved Peggy Gyulai's work; her paintings speak to me in the way certain paintings do, that make them a pleasure to look at and contemplate for hours. One was a nearly doorway-sized piece of canvas with a waterfall cascading down it; I coveted it, but it was ever so slightly out of my price range. Her paintings are inspired by pieces of music, which is perhaps one reason why they seem alive. Tessa Merrie's compositions are about natural objects, but to me they speak of separation and isolation in a way I like. Upstairs from them, Wendy L Miller has a number of paintings, but the series that caught my eye were her books. She picks up old books solely for their title and cover, sews up the pages so no one can read them, then paints both covers in a way that suits the title. ... and there was plenty of other great art there too, some of it even affordable. I couldn't figure out if working there would be more inspiring or intimidating. I happened to stop in Carole Moore's studio (saw the sign on my way elsewhere). She has beautiful koi paintings, including one huge koi spread out over six or seven canvases of different shapes and sizes. But my favorite was this one (I think) for the texture. ... Yes, I did notice that all my favorite artists today were female. And some of them were cute. (In fact, there were a lot of cute girls at the open studios. Hunh.) I don't think that tinged my opinion of the art, especially since I liked some of their art before I ever met them. ...But I figure it can't hurt their art sales. I've never eaten here before, but it was a block away from 1890 Bryant, so I stopped in after the studios closed. Trendy? Yeah. But their ambience and presentation were as good or better than any other sushi joint I've been to. 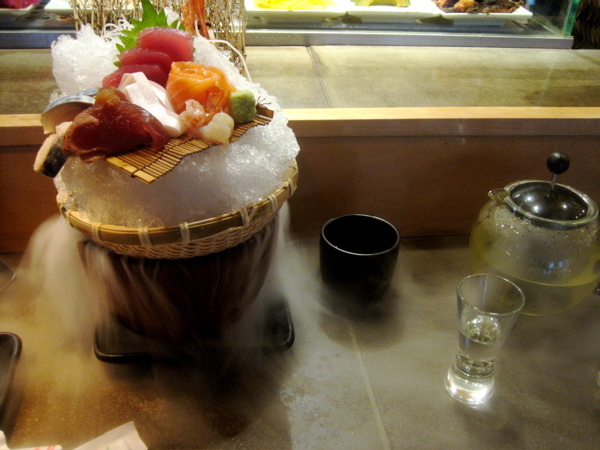 they delivered my sashimi sampler on a bed of dry ice. "here's a touch of vegas for you," said my waiter. They charged for my tea and miso, I had some yummy not-so-alcoholic sake with my meal, and I went for the raspberry cabernet sorbet afterwards, so my dinner came to about twice what I normally spend on sushi. But their ambience: excellent. Tea: excellent. Sake selection: I'm not that up on sake, but it seemed really good. Miso: good, not the best I've had. Fish: I usually judge by the sake (salmon) and maguro, which were good but not amazing. But the other fish, which I usually like ok, was really delicious, so it all evened out. Wasabi was the mildest I've ever tasted. The somewhat clueless couple next to me at the bar had the waiter choose their dishes for them, and he was bringing out some funky- (but tasty-) looking stuff. I know I'm going back, sooner rather than later... gotta try some of that. Perfect sushi joint? Not sure they exist. But this one's certainly piqued my interest.